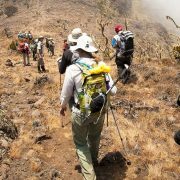 Machame Route; the most scenic of all Kilimanjaro routes involves more of hiking on the lower slopes and it takes one through a variety of vegetation types starting right from the Savannah. 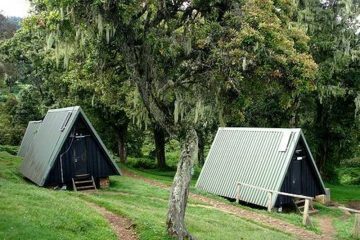 Trekking mount Kilimanjaro on this route unlike the Marangu route; climbers camp at Mountain campsites throughout the climb and it is believed that is why this route is called the Whisky route owing to its difficulty in nature as compared to the other famous routes like Marangu. Kilimanjaro trekking via Machame route is for the more adventurous hiker but it rewards the hiker with stunning views not to be forgotten in the near future. Machame route involves walking approximately 100 kilometers and it takes 6 days at least by the seasoned hikers and the physically fit, but better done in 7 days by the average hiker. 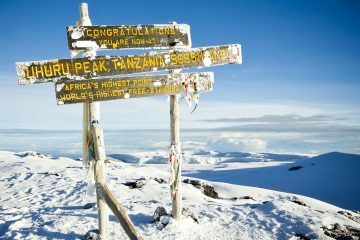 For a day by day program of our 7 days Kili climb via this route please click at the next itinerary tab. 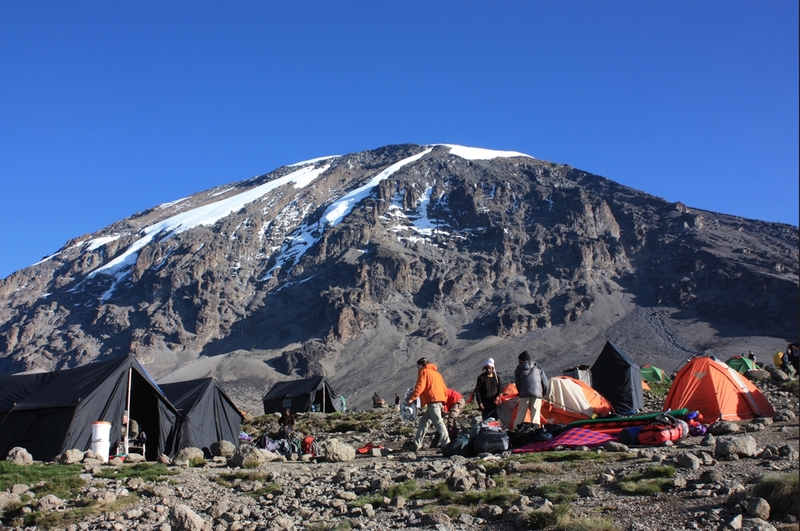 The same 7 days package can be done in 6 days by those who are ardent mountaineers or hikers and the physically fit persons who do not necessarily require a day of acclimatization for this Kilimanjaro climb. On this day you will be met at Kilimanjaro International Airport or at your arrival point and transferred to a hotel in Arusha or Moshi where you will spend your first night. AT the lodge our Representative/Manager will meet you to give you a briefing of the kili climb as well as go through your gear check together with your guide for tomorrow before you are left to relax. Overnight at the Lodge /hotel in Arusha or Moshi. Early in the morning after breakfast at your lodge/hotel, you will be picked up by our driver and transferred to Machame Gate lying at 1,815 mt/ 5,950 ft. You will go through the registration formalities as the porters assign the luggage’s among themselves and of you start on your first day of trekking. This is at the Savannah vegetation below and soon you are treated to the sight of a lot of exotic birds , and the Sykes monkeys as well as the black and white colubus monkeys on the canopies of the trees as they go on their daily life. In about 6 – 7 hours we shall be at our home for tonight; the Machame Camp that sits at just above the forests zone aprrox 9,850 feet. Today’s trek is a long one but not steep. Your porters surprisingly will be much ahead of you and on your arrival you will most probably find them having pitched tents and coffee is ready for you as well as some nuts or pop corn to enjoy and pass time. Overnight at Machame Camp. Lunchbox and dinner is included. Machame Camp to Shira Camp. After breakfast in the morning we are on the g again and this time through the savannah of tall grasses we pass across the beautiful heather land and alpine moorland all the way with wonderful views of the Kilimanjaro Peak one of the rewards of this route. The trek is filled with views of the giant heather and Erica. As we go the ascent begins to steepen and we scramble around some boulders as we enter this moor land zone which is typically marked with presence of lobelias and senecio species. Rocks draped by lichen beards which apparently protect the wild alpine flowers from growing at their bases. This night will be spent at Shira Camp that lies at 12,600 feet. We have walked about 5-6 hours today and fatigue is gripping in slowly. After meals we retire to our tents for overnight. Hoping to have now acclimatized enough we start our day by descending into the gorge before we descend its eastern wall enjoying views of Kilimanjaro’ s ice field that seem to defy the norms of the equatorials. We will continue ascending this day is steeper but we walk for fewer hours about 4-5 hours until we reach Karanga Valley Camp our home for today. The camp stands at apprx 13,900 feet. After having had enough rest we wake up just after midnight and start our last but challenging trek of about 12-17 hours to attempt the summiting. At around 12:30 to 1am we embark on our way up passing between the Rebmann and Tarzel glaciers and over to the rim at Stella Point. Temperatures are now below freezing point and as it dawns we’ll summit at the Uhuru Peak, which is the highest peak in Africa standing at 5895 m /19,340 feet, having trekked about 6-7 days. The excitement and satisfaction is just an amazing feeling up the rooftop of Africa. Jubilation rules the air and after a session of photos you will begin your way down 3-4 hours to Mweka Camp where you will overnight. You will have stopped at Barafu briefly to take your breakfast. Mweka lies at 9,840 feet. Approximately 3 hours you will descend down to the Mweka Gate where you sing out and bid farewell to your crew who without them you could never had made it, they are so crucial than you can imagine! It is here at the gate where you will also receive an appreciation certificate of ‘been there done it’. Persons who have made it to the Gillman’s point receive Green Certificates and the conquerors of Uhuru Peak they get a Gold Certificate. You will board a waiting vehicle and off you take off to Moshi town or to Arusha town where you will check in to relax ready for your safari extension or Zanzibar beach extension. If you are leaving on this day you will be dropped at Kilimanjaro International Airport to take your international flight back home. -We can arrange accommodation for you after the climb at Moshi or Arusha town if you need that . – If you need any connection flight like to Dar es Salaam or Nairobi, Kenya. – If you wish to go for a safari or Zanzibar beach extension after your Kilimanjaro climb we can seamlessly combine that for you. Just request for such a customized tour from our experts. Contact our Safari and Mount Kilimanjaro experts for the most updated prices and claim your discount.